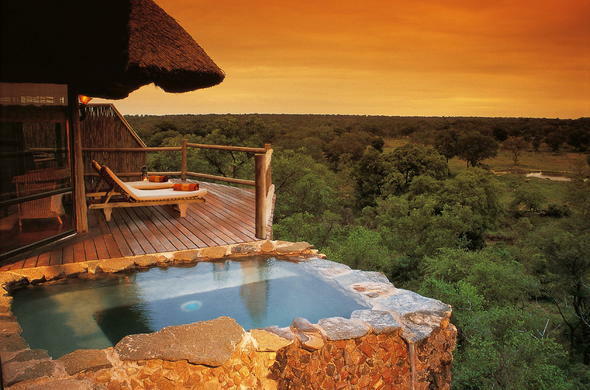 Enjoy spectacular views from every aspect at this lodge with endless panoramas in Sabi Sands Private Game Reserve. This safari lodge in Sabi Sands Private Game Reserve overlooks an active waterhole and you can enjoy intimate encounters in the wild from the safety of your state-of-the-art safari vehicle. Two daily game drives and bush walking safaris are conducted by highly trained rangers and trackers. In between safari activities at this Sabi Sands accommodation, choose a good read to relax and take a dip in your private plunge pool. Indulge in optional luxurious wellness treatments in the glass-fronted gazebo or in your suite. Meals are an occasion to look forward to at the lodge. Savour silver service dining in the lodge or on your private veranda. Enjoy outdoor feasts in the boma and on the upper deck. Wine connoisseurs will find just what they want in the wine cellar. Traditional full English and Continental breakfasts on the main deck are notable in charm and fulfillment. Breakfast is served after the early morning game drive and is the perfect way to start each day at the lodge. Lunches are served under big shady umbrellas, and are an occasion in themselves! The team incorporate the best locally produced ingredients and modernise old classics to produce cuisine that make you feel satisfied in every way. The luxurious glass-fronted suites at the lodge provide superb vista views of the bushveld and beyond.